The bean leaf beetle (BLB) is a small beetle that varies in color from golden brown to green, generally having four black spots on the wing covers, and always having a black triangle on the area centrally behind the thorax (fig. 1). Larvae develop below ground and can be found feeding on soybean nodules. The BLB overwinters in the adult stage, and resumes activity in the spring. It will be found feeding on soybean foliage soon after soybean emergence. The overwintering BLB adults feed on foliage and deposit their eggs in the soil. If a soybean field is late-planted relative to other fields in the area, the first generation may not become established in the field and the probability of early season BLB damage is minimal. However, if planted late and missing the first generation, the likelihood of the field staying green in September enhances the chance of having a higher second BLB generation. The BLB larval stage feeds on the root system, and after a few weeks the larvae pupate and adults emerge to feed on the soybean foliage. The current thought is that significant injury to roots by larval feeding does not occur. Bean leaf beetle passes through two generations in Ohio with the first generation of BLB beetles appearing in early summer and the second generation appearing around late August or early September. The time of peak occurrence of BLB adults per generation may differ from field to field depending on the date of planting because the time of initial egg laying in a field depends on the time of initial emergence of the crop, which attracts the overwintering beetles to the site. Late-planted fields in which the overwintering generation does not develop may be colonized later by migrating first or second generation adults. Because these fields often remain green into mid-September to late September, they often serve as a trap crop for second generation adults migrating from other fields that were planted early and are maturing. This sudden increase in second generation beetles may cause significant pod injury. A secondary concern with BLB is its ability to vector bean pod mottle virus (BPMV). Infection by this virus results in plants that remain green well past harvest maturity, with seeds that often are severely mottled. 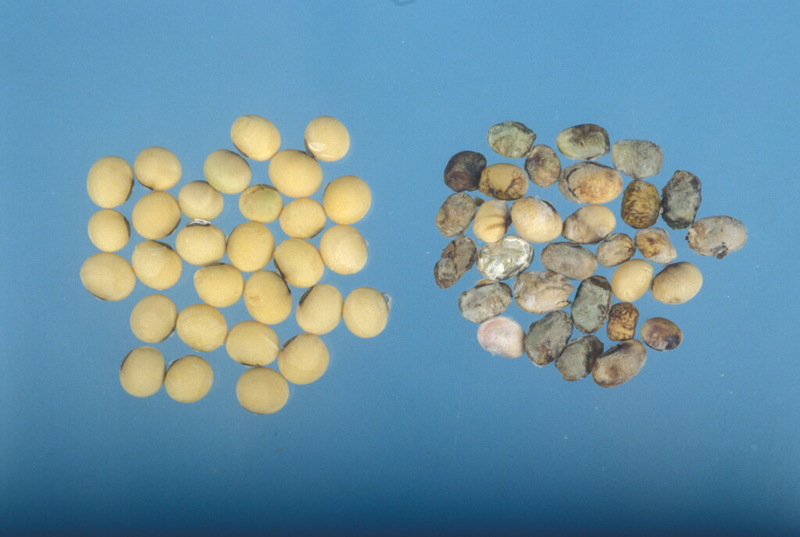 The concern with seed quality is especially important when soybean is grown for seed or for food-grade soybean. Initial spread is by the overwintering BLB population followed by secondary spread by first generation adults. Early planted soybeans, especially the first fields to emerge in an area, may exhibit seedling injury (fig. 2) due to feeding by overwintering adult BLB populations. Unless beetle densities are abnormally high and feeding significant, this early season defoliation is usually not considered economic. Feeding injury by the larval stage on the root nodules may be detected, but such injury is not regarded as economic. Foliar injury due to adult BLB feeding (fig. 3) will again appear in early July and continue until fall as a succession of first and second generation BLB adults emerge and feed on the crop. When pod set occurs, BLB adults will begin to feed more on the succulent pods (fig. 4). Pod injury caused by BLB enables infection of the developing bean seeds by microorganisms leading to moldy beans (fig. 5) that (1) may exhibit incomplete development, (2) stick to the pod and are lost during harvest, or (3) appear in the final harvest causing dockage at the time of sale. Thus, pod injury can result in both a yield loss, as well as a loss in seed quality. This latter concern is of great importance when soybean is grown for seed or for food-grade uses. Early planted soybeans, relative to other fields in the area, may attract large numbers of overwintering bean leaf beetles. Periodic inspection of early planted fields is advised, especially if the field in question is the first to emerge in the area. A heavily infested field may serve as a trap crop attracting many beetles to a single location and providing an opportunity for early control of a potentially injurious BLB population. Although economic injury is relatively rare at this time of the season, severe leaf feeding can cause significant damage and should be stopped if defoliation goes over 50%, plants are being stunted, and beetles are still actively feeding. In late June and July, when the first generation of BLB adults begin to appear, periodic sweep net sampling for determination of BLB population abundance should be initiated plus periodic assessment of defoliation injury. Periodic sweep net sampling will provide a measure of BLB abundance and facilitate an awareness of trends in first and second generations of adult BLB activity. Sweep net sampling should be taken as sets of 10 sweeps at 3 to 5 locations in a field. For defoliation assessment, 20 random plants should be pulled from the soil and an estimation of the percent defoliation made. Care should be taken to estimate the percentage over the entire plant, not just only the top third. Often the level of defoliation is much higher on the top portions of the plant, with relatively little on the lower two-thirds. Prior to pod formation, decisions to apply an insecticide rescue treatment are based primarily on the observed defoliation caused by the total pest complex. In regard to defoliation, BLB may be causing all or part of the observed damage. Since defoliation may be due to one or more insect pest populations (BLB, Japanese beetle, Mexican bean beetle, etc. ), periodic sweep net sampling will provide an indication of the presence and relative trend of defoliating insect populations. Rescue treatment is justified when defoliation exceeds: 40% prior to bloom, 15% from bloom to pod-fill, and 25% after pod-fill to plant yellowing. Pod injury due to adult BLB feeding may be detected following pod set. Evaluation of pod injury should be based on inspection of all pods on 10 randomly selected plants. On each plant sampled, count the number of total pods and the number of pods exhibiting pod injury, and then determine the percent pod injury based on the 10 plants inspected. It is important to estimate percent pod injury on inspection of the entire plant. Treatment is justified if the percent pod injury is reaching 10 to 15%, and BLB adults are still present and still active. When the decision to make a rescue treatment is made, there are numerous foliar insecticides to use. When applying a treatment for prevention of further pod feeding in late summer, growers should be aware of pre-harvest intervals for many of the insecticides, which range from 14 days to 60 days. The time period left before anticipated harvesting of a field might dictate the insecticide chosen. When the concern is BPMV (fig. 6), a different management approach can be attempted. Research from other Midwestern states suggests a two-pronged approach is needed initially against the overwintering population followed by control of the first generation. An initial insecticide application should be made against overwintering BLB as soon after crop emergence as possible when BLB adults are first noted. A pyrethroid insecticide should be used because it offers longer control against new adult insects that might arrive at a later date. A second insecticide application, again with a pyrethroid insecticide, should be made at first sign of the first generation in July. Whether a seed treatment that will control overwintered beetles in the spring can replace the first foliar application is debatable, but worth attempting. This approach of controlling BLB for reducing the incidence of BPMV to an economic level is questionable, and is still being researched. Until soybean resistant to BPMV is developed, insect control is one of the few things growers can attempt. See Ohio State University Extension Bulletin 545, Control of Insect Pests of Field Crops, for those insecticides labeled for bean leaf beetle, or for all insecticides labeled on soybean. Bulletin 545 can be accessed at agcrops.osu.edu/publications. Additional information is available from your local OSU Extension office or The Ohio State University Entomology Agronomic Crops Insects web site (entomology.osu.edu/ag/).